Great day today, busy, still managed to have lunch and afternoon tea! Unusual to see the Highline empty but not for long! Roo. And lastly . I have been filling in the aisle with removable scenery boards here is the latest board this entire aisle can be removed in minutes if needed. The three boards with the electrical towers on them can all be removed. Nothing is finished yet I intend to build a power substation on one of the boards. Beyond wonderful, ROO, and I know what I am seeing there, having lived the 40's - 60's in my hometown Pittsburgh area. In fact, I worked as a common laborer at National Tube, McKeesport, PA, for one very hot summer, earning extra money, as a teenager, for college, right under this facility , cleaning out the "scales" that fell to the sewer that ran under these pits (We also killed the rats that ran around in there, using the firehose to dispatch them.) It was so hot down there that, even though we were young and strong, we had to work for 15min and then sit for 15min, etc. If we did not rest every other quarter hour like that, we were fired (no pun intended) for endangering ourselves in such hot conditions. I love your creativity, there, and especially appreciate your realistically stressing the profound presence of long lines of trains within the precincts of such a mill. Love to see some video of the trains in action. Frank. That is a great photo of the ingot being lifted out of the soaking pit I would have dearly loved to have had the space to fully detail inside my buildings but with O scale in the room I have it's just impossible. Here is another photo from yesterday. It's a quiet time at Waterside yard, this yard is the interchange yard for the Mill. All the trains for the mill go through this yard usually it is jammed with cars of all descriptions the Lackawanna loco moving a Mill Gondola of furnace scrap must be on loan to the mill this job is usually handled by the Blue (one shown in the photo with a low clearance roof) Republic Steel Switchers. Of course Big John might have grabbed the nearest loco to do this job maybe! A slab train has just pulled a cut of flats out of the Blooming Mill this train will then move forward to the tracks on the left and make it's way to the Rolling Mill where the slabs will be converted into Coils of steel for a customer. Roo. Roo, it looks like another fun run day at the mill. The republic coil cars look great. Do you remove the electric towers when you remove the boards or are they permanently attached? Wonderful layout and I am looking forward to future Videos and posts. Neat idea on the panels and access aisles. ROO, did you work in the steel industry? Hokie 71: No I have never worked in the Steel Industry I do buy endless books for research. Excellent work Roo! Might I inquire where these background images came from? Have about 10' to fill. Very nice. No shortage of action there. BOBBYD: I found them on the bay under angietracksideflats he ships to Australia so I bought my backdrops as paper in a tube as they had to travel a long way. I glued the backdrop paper to Foamcore and blackened the edges. Roo. Thank you Neville, hope you have a safe, happy, and prosperous New Year. Would like to make it down one day. Laying some track today trying to finish off the foundry and the Slag reclamation mill. Good to be back working on the Railroad. Roo. Looks like you're having a blast. Thanks everyone I will post some photos of the progress. The "foundry" is supposed to be a pipe factory as well as a foundry gives me an excuse to run some Bulkhead flats, Hot metal cars, depressed centre flats, lots of action, looking forward to finishing this section have to take it easy today my back is playing up after leaning for hours over the layout yesterday. Take care and watch your back! Roo. Despite a sore back I'm happy with the progress so far. I am making a sign for the building at the moment. the workshop is bashed from a Heljan kit will eventually have a fully detailed interior in fact if you lift the building up there are a pile of detail items inside waiting, good place to store them. The floor is not glued down so I can detail the interior of the workshop at the bench. 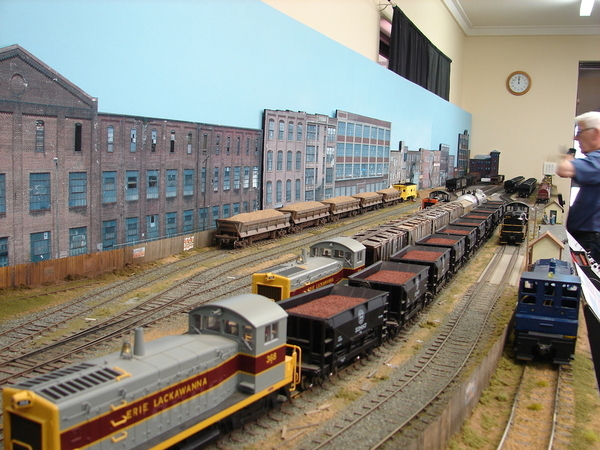 Because we operate the layout every week and enjoy switching there is not a lot of room for details like pipes and castings sitting in the yards the tracks come first the scenery second. The crane needs some streaks of rust and dirt on it along with everything else ! Roo. Well...It's summertime, it's painting time, so I go down to my favourite hobby shop to buy a dozen cans of rattle gun paint only to find it's closing down! Sad he was only 15 minutes away no train stuff but plenty of paint I suppose it's the same the world over the internet is killing off the trad shop. Roo. Publicity shot for Valley Pipe and Forge. Roo. ROO, about the "Publicity shot" : When I have to lean forward and squint to get a closer look at the scene (above) to determine if it's great modeling or real-life.... Wow. And WOW again... that's great modeling!!!!!!!!! ROO, Frank is right, you cant get more real than that! Wonderful work! Mike, You are one of the more delightful voices on this forum that I always make a point of reading. So, when I see that we are in agreement about another hobbyist's work, that is a bonus, as far as I am concerned. You seem like a really good guy, so I am glad to have been in your company here. Thanks Frank, I try to be positive as this is spose to be fun! Plus there is so many great people here with such great skills! The best part is the sharing of thoughts and ideas! It really means a lot to me getting this comment from you! Thanks Frank. I've looked into your history and you are a great modeller yourself so coming from you that is a compliment that I appreciate. Now Mike I notice you were in Artillery corp. In 1970 when I was based at the Australian task force at Nui Dat (small hill) the Americans had a couple of big guns in the centre and every second or third night they would fire a couple of rounds 10 miles into Nth Vietnam. You would be in your hoochie asleep and all of a sudden Boom! are we under attack? No it's just those crazy yanks firing their big guns. The guns had a type of bulldozer blade on the rear dug into the dirt to absorb the recoil and were on tracks. Roo. Everything on the layout is magnificent, Roo. Enjoy it and happy new year. Here are a couple of photos I snapped yesterday two shows Erie 435 switching Valley Pipe the third shows the other end of this district on a very quiet day. Next week we are installing a new Control Panel for this district which has a number of new industries plus a passenger station with a single team track. Most of the industries here are connected with the Steel Mill in some way like Valley Pipe and Forge receives among other trains Hot Metal trains there is also a Slag reclamation plant and a scrap yard that delivers scrap to the Basic Oxygen Furnace (BOF) the interchange yard has only three tracks (no room for more!) enough for the trains. There is a Locomotive that is rostered here permanently just for switching and making up trains. Roo. Roo, everything really looks fantastic!!! The Army wanted us to make them NBC capable then dropped the project. Somewhere I have pictures of the front 3/4 gun enclosure designed to protect the standing crew from rifle fire. That's the one! Love the video way to go mate! The ground used to shake when those things were fired. We worked with you guys and US gunships supported us in SVN. Aussies have worked along side Americans in most modern wars. Thanks everyone for your kind words about the layout I will have more photos soon. These photos are the new control panel ready to install next week. Roo. I thought I had more coil cars. After a post by Roo, I went down to look and I only found one by MTH. I got lucky and found another at a great price right before Christmas. Deichman's Model Train Depot had them and I wish I had got them all. I am thankful for the one I got. I will get more as I can. The Atlas cars are another great release in O scale for me. Anyways when I see pictures like these above, I have to pursue making it on my RR. I visited Republic Steel, and Bethlehem Steel when I was younger. The huge scale of those places amazed me then. Roo's layout took me right back to my youth and seeing those sights again. I am fond of tank cars so I will try to have a facility for those, along with my other favorites like auto carriers. Now with the steel cars in my sights, I may need a bigger house or I'll have to get creative and compress some type of scene. I am jealous of the quality work posted here and I think it will influence my layout moving forward. Just a bit of info you may use or discard as you see fit. On the prototype railroad the "control panels" were and are still called model boards. As a modeler I am in favor of using prototype terminology where possible to both increase realism and historical accuracy of modeling efforts. As an aside, I was once a Block Operator at Morris Tower in Morrisville PA, where we sent and received frequent transfer runs between Morrisville freight yard and United States Steel's Fairless Works. Part of a 1979-2011 railroad career. When you finish this layout, I hope you keep it. I seem to remember reading about your earlier layout years ago in OST and liked it very much. As I recall, it was based in Brooklyn. Is that correct? Does that layout still exist? Any pictures?